Should We Just Call It Pink Puffy Paw? One of the biggest problems with getting care for rheumatoid disease is that symptoms do not look exactly the same every day. Of course along with that is the fact that many symptoms aren’t clearly visible anyway, hence the term “invisible illness.” Anyway, it seems like it would be a great thing to actually see a doctor on a day when joint symptoms are very noticeable. And I had one of those lucky days last week. What’s it called when a hand swells up like it was inflated with a bicycle pump? Sometimes my hand swells up so that it can’t be used and screams in pain (like here) if it’s even brushed against. It starts as intense stiffness down the center of the hand and up the middle finger. Then the middle finger swells. Eventually the whole hand is puffy and the skin on the palm side is smooth. 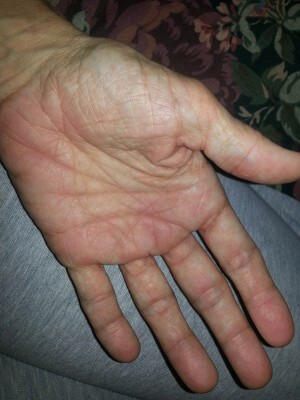 (When not swollen, my hands have deep lines and fairly loose skin, shown in my right hand here.) So last week, my left hand did its thing and I called the orthopedist office to see whether the hand specialist had an opening in the schedule. They did. But the hand doctor didn’t know. He said he could tell the tendons were inflamed, and he identified a nodule on the tendon of the middle finger along the knuckle that seems to be the epicenter of it all. But a reason the hand swells up, or what to call it? No idea. What to do about it? He said to try ice, and increase my prednisone, and we could inject the joint with steroids if I wanted to… all familiar of course. An odd thing happened – the doctor kept asking me whether my red swollen hand hurt. Of course my words said “yes,” but I didn’t flinch in front of him (even though I cried in the car). So he kept asking. That old rheum stoicism keeps us from openly showing distress. (For me it started with the embarrassment of crying through a 29-hour labor.) Why does there seem to be honor in appearing strong enough to remain silent? Even when my hand finally cooperated to display its pain in front of a doctor, the rest of me couldn’t cooperate. WHAT ABOUT YOU? Has your whole hand or foot swollen up at once? Did a doctor tell you what to call it? Do you ever have a hard time telling others how much rheum disease hurts? It’s Simple: Who Gets Dactylitis or “Sausage finger”? I stopped all my meds last January. I had been taking Enbrel and mtx since 2004, (and other injectibles along the way). My RA is not worse, not better, but I feel so much better not catching every virus, and it seems I have fewer flares. My rheumey was hesitant to let me try no meds, but since i was sick all the time and missing a lot of mtx and enbrel, we decided to try it for a year. I don’t know if I am in remission..my labs are still the same. The other thing I wanted to say is I have a digital camera and whenever i flared before I took pictures, they are all on a dvd, dated for reference or when the flare is on a non Dr. day. Good to see you back, Kelly! yup, I’ve had the red puffy hand. Most times the two of them at the same time, both screaming pain. I wasn’t lucky enough to get in to see my rheumy when it happened biut I did get pictures. When I got to see him, his response to the pictures was “Yes, they do look puffy”. That was it. No questions or other comments. I thought I had shown up to my appointment with the proverbial smoking gun & it was just passed off as inconsequential. So the battle continues. I have had the red puffy hand. It always starts in my index finger and goes into my palm. The dr just nods when I tell her. I have been on mtx again for 8 months, plaquenil for 2 1/2 years, and remicade since June, nothing is working yet. I have tried Humira, Enbrel and Xeljanz, still RA marches on from joint to joint in my body. Every joint from my neck down has been hit!! But wait – my rheum doc said that all four symptoms had to be present for rheumatoid — Pain, Swelling, Heat, Redness. And if even one of the symptoms were not evident to him it is OA and not RD. I have no idea how he relates the Vectra results of “high disease activity.” BTW, the first rheum doc x-rayed hands routinely to monitor potential erosion due to concerns with swelling. Second doc never x-rayed hands in three years and they continued to get worse. Yes, hand(s) very swollen, missing those cute little lines around the knuckles and in the palm area and mine goes into the wrist along with throbbing pain. I think Elaine nailed it – it is inconsequential, not just invisible. The response I get is ‘yep, it’s swollen’. My hands are often swollen and painful. But about two weeks ago they swelled so bad I could not close them. I thought there was no possible way they could swell anymore without my skin busting! It lasted 2 days and was very painful. I tryed ice (which i hate to do because I hate the cold) but it didn’t seem to help. My rumatoligist who was excellent moved to Texas. But right now there is nothing I can do med wise anyway. About a year ago (nov.21,2013) I had went through all the meds ( shots, pills, infusions) with no results, and had been on xelajans (sp?) for about a month when me and my husband where hit head on by a drunk driver. Dispite wearing my seat belt I had 3 broken ribs and my left leg was a mess. I had to go to St.Louis for a 9 hour surgery to put it back together. Now I have 3 plates and 14 screws in my knee and hip. Because of my lowered immune system from the xelajans I got a staff infection in the hip. And now because of the infection and r.a my hip has gone arthritic they want to replace it. I am 35.Also because of the infection I have to be on antibiotics for a year. So we can only treat the r.a with prednisone and they don’t even like that. It’s been so hard. I still can’t walk, using a walker kills my hands. The pain is incredible. I thought my severe r.a was horrible, now with a major injury it’s impossible. I feel like I am drowning. I have no muscle mass left in my hands. Most of the time they are as flat as pancakes, yet how they can swell and puff! I can no longer make fists because several fingers on each hand refuse to bend and really–doing ANY thing with my hands increases the intense, constant pain I feel in them daily. 24/7. Non-stop. I am seeing my hand surgeon again next week (surgery was halted last time because I was in so much pain in other areas he felt he could not operate!) but I do feel somewhat hopeless. As far as ‘being brave’ and not sharing how much it ALL really hurts, hello! I am doing physical therapy twice a week now (hospital pool) in hopes of strengthening my legs for knee replacement surgeries and also for my back and still I find it hard to be honest with my P.T. Every time she asks what number my pain level is at (I hate those numbers which truly do NOT explain it all intricately enough) I want to fudge and give a better number than I’m at. Why? I don’t know….other than being taught to always put on a brave front. Never let ’em know how much you really hurt… Hide those tears. I had just the same opportunity last week. I happened to have an appointment on the day my hand and wrist were so swollen and painful. The unfortunate thing, is that it was treated just the same as any other time. The same treatment options that you received. I also have times when I am in so much pain when I see the Dr., but for some reason when he presses on my joints etc…. I just don’t react. It is a weird phenomenon isn’t it? But, sometimes my joints are so painful just at rest and not painful to the touch. This disease is such an inigma not only to us, but unfortunately the medical profession as a whole. I so appreciate your efforts to make the world aware of RD. Special note Kelly, I am so glad you are back and okay. I was very worried about you. Be safe. I get “sausage fingers” also my right thumb will swell and not want to bend at all. I get red spots that pop up out of nowhere, burn and swell and then disappear a few minutes later… my doctor has never seen those as they are so very random. 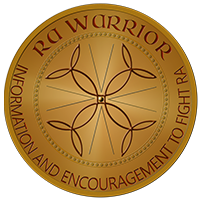 I am lucky with my Rheumy as he believes I have RA even though I do not always show all the supposed visible signs, and my blood work tends to be normal except for my white cell count will be high. I have been through Methotrexate, and most of the injectable biologics with no success. I am now on a combination of Xeljanz and Plaquinel and they seem to have leveled out my unflammation and I have only had a couple of flares and they only lasted a day or two. Here is hoping it lasts for a while. My prayers to you Kelly and all my fellow RAW’s for healing and understanding from others!! I think I have it easier then most of you as far as pain is concerned. It’s only bad during flares. My hands are swollen most days and like you, my lines go away. My more painful issue is my feet, mostly my left. It swells most days, feels like I’m walking on marbles. It is a hot spot that never seems to let up. Some days my shoes are really tight, others not at all. Also, I don’t have redness or high markers for inflammation, but high r-factor etc. I have switched to metho and Enbrel for 6 months. I think it is improved. I have recently started eliminating processed sugars and flour and drinking 4 c of green tea daily. I think that has made a big difference as well. I think we become acclimated to the pain over time, and unless it is really bad, we just accept it. So when DR’s say are you in pain, you say yes, but act like it’s not a big deal, because that’s what you are used to. God Bless you all. Hi Kelly. I missed you and it’s good to have you back. I wondered if anyone else had the experience of “flaming hand”? Both my daughter and I experience this: I wake suddenly with the feeling that I’ve just removed my hand from a stove burner. It really hurts! (May I whine?). Shaking the hand or plunging it into hot water helps (a little). Stiffness, swelling (slight), and tingling/pain in the index-middle-ring fingers follows. Although I’ve been diagnosed with RA, the doc told me this was “just” carpal tunnel syndrome and perhaps I could wear a brace at night. This really didn’t make a difference. Hi Kelly—Thanks for your reply. I’m happy to say that I changed rheumatologists (even though that’s awkward). The new one didn’t mention carpal tunnel syndrome, fibromyalgia, “just” edema, or accuse me of drug-seeking behavior like the former one. He looked at my hands and said, “I don’t like the look of that. We’ve got to do something about it.” Since I’ve been off all rheum. medicines, I’ll start over with Methotrexate, this time with injections to by-pass stomach problems. Meanwhile my primary physician prescribed gabapentin. This treats nerve pain very well but can make me dingie and off-balance– definitely not a long term solution. So nice to have you back, Kelly. Sorry to hear about the puffy paw. Why, oh why, does RA have to have so many odd manifestations and appearances/disappearances??? Sometimes I feel like it should be called Medical-WhackaMole. You never know where it will appear next, if it will disappear, wane or get worse. whackamole is the perfect description – a friend said that to me last week. yes, I regularly experience the red, inflamed, sausage, painful fingers and hands. I have had RA for almost 20 yrs with overlapping connective tissue conditions. Ice and strong antihistamines (Atarax) help my puffy hand symptoms but the flares usually last at least 24 hours with no apparent triggers. It’s nice to have the support of others on this site. Well I’m the exception to the rule then because I am NOT quiet about it! In a way, and I don’t mean this personally toward anyone reading and certainly not toward Kelly bc this site is amazing so please don’t take offense, but it kind of ticks me off that everyone else is so stoically silent about it because that contributes to the lack of understanding about the disease and how bad it can be! I feel like I didn’t ask for it, it’s not my fault I got it, it’s nothing to be embarrassed about, nothing I did contributed to it (unlike smoking and lung cancer for example), it is every bit as bad as cancer in my opinion and in some ways worse because some forms of cancer have a great success rate with early treatment and many patients end up cancer free with normal healthy lives… Unlike us who will progressively get worse as time goes on until we are disfigured, crippled, and eventually killed when it attacks our organs. Think about this… Why SHOULD we get any less sympathy than cancer patients?! Even lupus patients get more awareness and sympathy than we do! When I was diagnosed with RA, I literally breathed a sigh of relief and told my Dr I was so glad it’s not lupus. And the more I’ve learned about RA… Now I’m kind of thinking it’s worse than lupus! Seriously. I wish every RA patient would scream it from the rooftops so people GET IT. It was from this site that I learned how pitiful the funding for research is for RA per capita compared to other diseases. And not for nothing, but every time each one of you grins and bears it and suffers in silence instead of telling the world how bad this disease hurts and totally disrupts your life, you are basically enabling the misunderstanding to continue. If this sounds angry… Well I just hit my one year anniversary since diagnosis, and I think all those stages of grief they talk about are applicable in coming to terms with chronic lifelong illness… Shock, disbelief, sadness, anger, all of that. To be honest with you I am angry, and when I read that our disease gets such pitiful funding compared to comparable diseases that affect far less people… That kind of pisses me off! It’s not fair! And so I kind of want to scream that no, we should absolutely NOT be suffering in silence! We should be suffering LOUDLY until we get the funding we deserve for research and make headway with changing the name to RD or RAD, and get more awareness out there so people stop condescending and belittling what we go through because of the stupid “arthritis” in the name! I don’t even have freakin arthritis yet!!! Hi Carolyn, it’s ok to “sound angry” or blow off steam here – that’s what we’re here for. If we can’t try to understand your journey, who can? If you haven’t, you might want to read the “tug of war post” –click here, where we discussed the comment by Rhonda (linked to in the first line of that post). She was frustrated in a similar way to you. I can’t speak for everyone, but it seems many people with rheumatoid dz (PRD) report having been through some dismissive attitudes from others that eventually led them to the what I’ve called the stoicism of rheum – click here to see. The other main contributor is that for some, the pain / disease activity is pretty constant, so there is a subconscious (or also intentional) adjustment of our pain tolerance. We can’t cry 24/7, so we force ourselves to push the pain out of our thoughts like a type of healthy denial, instead of letting the pain win all of our attention. We try hard to keep the disease from taking over; so even when it is extremely fierce, we determine to overcome & “ignore” it more fiercely. But there are many stages of the disease (& the grief) we all endure, and no rules of what is the only right way to face them. I love your passion & agree with you we have gotten a raw deal w/ the disease name especially. I had this happen earlier this year before I was diagnosed. I had an endo appointment and while I was there my wrist started turning red and swelling up. He called my GP and she got me right in. By the time I was saw her the redness and swelling has spread to my hand so she sent me to the ER. At the ER they couldn’t decide if I had cellulitis or gout. My tests for gout came back normal but the doc was convinced I must still have it but put me on antibiotics anyways. Fast forward a few months and a double bout of frozen shoulder and tennis elbow in both elbows and after a few tests my ortho doc says he suspects RA. I had just had what was suspected to be a reaction to an antibiotic for a throat infection but my GP said she wanted to run some tests to rule other things out. I got the results back the same day my ortho doc said he thought I had RA. 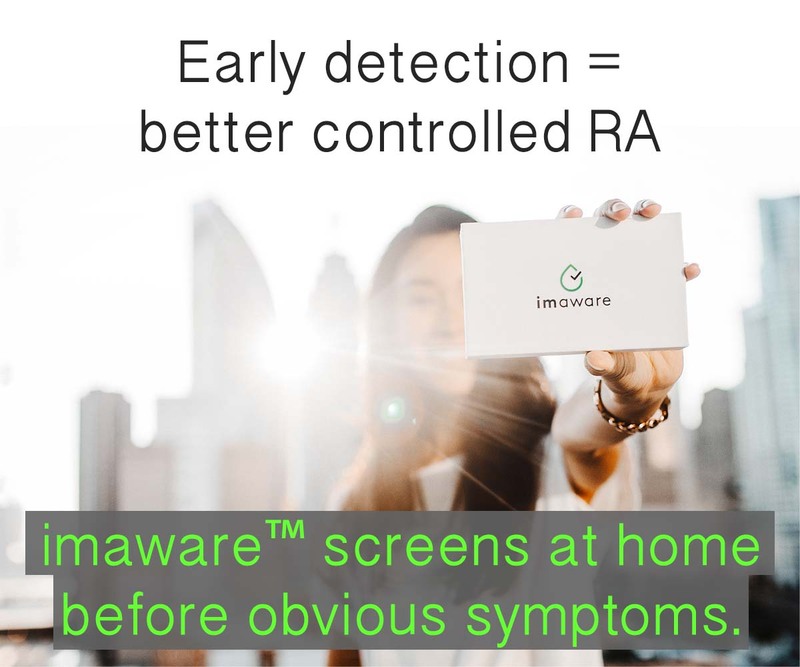 Yep… they were tests for RA and they were positive. I still get swelling and redness of my wrist and hands not as dramatic as that first time. I am on mtx now and hope it helps as the pain has started up in my hips knees ankles and toes now. I am delurking to comment, because for some reason or other my experience with the medical profession over this has been slightly different. I am now half way through my fifth year since I was diagnosed with RD. I was caught very, very early on in the disease, in part because I was studying to try and enter medicine (and didn’t the RD put paid to that dream..) and so was often using my own biological processes as an observation point. I’d always had a slightly weird set of inflammatory markers that were slightly elevated, but within normal range for someone on the pill. But I kept getting strange fluid retention like puffiness in my feet and hands and kept hassling my GP about it, but there were no other real indicators of what it could be and well, needle in a haystack. This resolved over a period of five years into a break out of RD when I was under stress moving house. The referral in the end was off the puffiness, aggravated morning stiffness, blinding fatigue and bilateral pain. Initially I had Rheumatoid factor, but have since only showed serum negative. Now my hands and feet do this on a three monthly cycle or when I am stressed/over tired. I get the puffy palm, and have started getting a little heat and redness that I never had before. The burning has always been there and is at its worst in summer. But it has always been this puffiness that the Rheumatologist used as a clinical marker to monitor my disease progression. I walk in and my hands get checked (made more difficult by the fact that I have hands that look puffy to start with). His explanation to me, when I asked, was that because there is no accrued joint damage yet so x-rays are useless, and my blood reads now as ‘normal’ (go medication!) but clearly there is disease activity even if it is not as severe as it was sans medication. I liken it to the continental plates and sitting in a high risk seismic area. Like Wellington in NZ (I am Australian) you are on five fault lines and it is a given an earthquake will rip you apart, but then Christchurch gets hit three times instead. Good luck that the earth changed a bit, but it is still a matter of time. When we talked about management he gave me some anti inflammatories, but mostly we worked on other methods – cool water (less painful to the touch than ice) in a bowl, heat for the times when that works, and if I catch it early enough (it always happens around my menstrual cycle when there is elevated inflammation) then I wear a light pressure glove because I can sometimes trick my brain into focusing on the feel of the whole hand surface not just the painful parts. If there is joint involvement though this is not an option. Severe puffiness with stiffness is also sign that I need to back off on things – the deeper wrist and finger pain will be along soon and then the larger joints play ball. Mostly I am annoyed that when it happens with my feet I have to go up a shoe size. Anyway, I just wanted to share a version where it is not just a side symptom but the main cake. FYI, you can buy home paraffin baths pretty inexpensively. I bought mine off Amazon with the wax, mitts, and some other stuff. It’s lifesaving in the fall / winter when my left hand swells and gets particularly bad. I’ve been thinking about your post because it reminds me so much of my daughter’s experience. 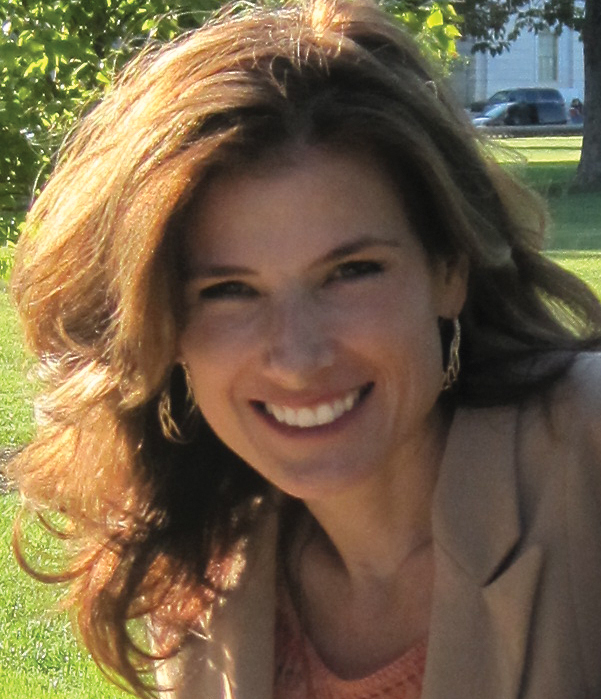 She was diagnosed with RA at age 19. Like you she is now 35 and dealing with severe RA. I wanted to tell you that she was glad to get replacement joints (hip and shoulder). She found that because she’s young, healing was very speedy and the operation left her pain-free in both shoulder and hip.She used a type of crutch that has a platform for your forearm and a vertical handle to grip– her hands are quite bad so regular crutches were impossible. Please hang in there; there is something that will help and comfort you. PS my recent post,#20, was a reply to Wendy Bryant’s post, #8. Any suggestions for handy kitchen gadgets to open cans or bottles when RA hands are so tender and weak?